Alpaca is the secret ingredient in Dahlgren's new sock lineup, including the Sno Comp, a sheer, cushionless ski sock that uses a fairly complicated Merino/Alpaca/Synthetic blend. For the curious, Alpacas are those not-quite Llamas found in South America. Alpaca wool is said to be lanolin-free, less irritating than regular wool, and thus (perhaps) a better choice for people who are allergic to wool. In the Sno Comp, Dahlgren employs three 'zones' designed to manage moisture. The so-called absorption zone (heel and toe) is a Merino/Alpaca blend. The 'transfer zone' (arch/instep) alternates the same Merino/Alpaca blend with a nylon/polyester/Lycra blend in a series of rings. The evaporation zone (the leg) is entirely synthetic. That's kind of a lot of complexity when it comes to socks. How does it all work together? I like the Sno Comp's sheer, smooth texture. The transitions/seams betweens the zones are indistinguishable, and the sock itself is ultralight and sheer, giving us a sock that feels like one continuous...sock. I noticed absolutely no hot spots or pressure points against my skin. I did find the Sno Comp a tad itchy on first use, though I wasn't sure if I could objectively quantify it compared to my SmartWool socks. So, I began skiing the Sno Comp head-to-head versus my favorite Smartwool PhD Ski Ultralights, and trying to identify any differences. After one wash, the Sno Comp's itchiness faded to the point that I couldn't really tell a difference. Of the two socks, I liked the Dahlgren's texture quite a lot. Friction matters a lot to me when I'm choosing a ski sock. 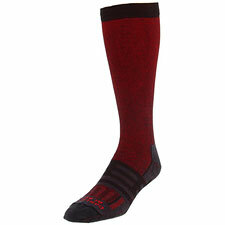 I like a sock that's silky but not too slippery against my boot liners. I must say, the Sno Comp seemed to really hit this quality perfectly—finding exactly the right combination of friction and glide, better, even, than my Smartwools. In terms of warmth and moisture management, however, the Smartwools really seemed to trounce the Sno Comps. This was a bit of a surprise, since moisture management is such a focus of the Sno Comp's design. Still, my toes tended to feel cold and clammy in the Dahlgrens, whereas they remained noticeably more comfortable in the same conditions wearing my Smartwool socks. On reflection, it's hard to explain why I was experiencing this difference. Smartwool does use more Merino in their socks, and they put more of it next to your skin, but by the numbers the differences would seem to be small. Perhaps the issue is not moisture transport but rather comfort when wet. In that case, I would suspect that pure Merino is outperforming Alpaca. In any case, I still like the Sno Comp's texture a lot, enough to keep using them in warmer conditions when cold toes aren't going to be an issue. And for those of you who are fans of Alpaca, the made-in-the-USA Dahlgren offers a quality alternative to Smartwool's Merino at about the same price.